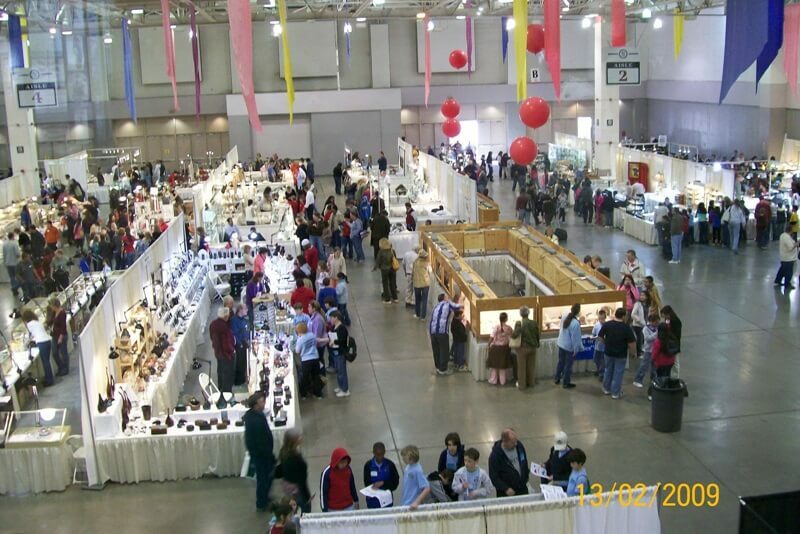 We are now entering the Jewelry Designer's number one destination, the Holidome/Gem Mall complex. 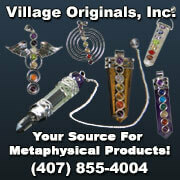 This wholesale only show has jewelry making components, gems, beads, pearls and finished jewelry. 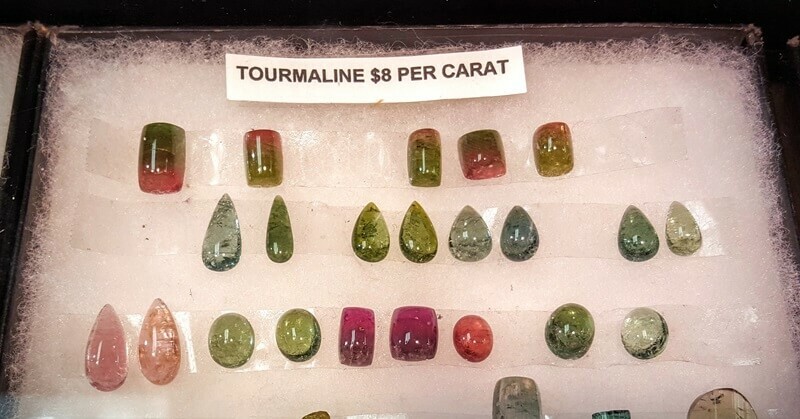 American Turquoise represents a number of mines and sells turquoise from each of them in rough and cut forms along with beads at wholesale prices. 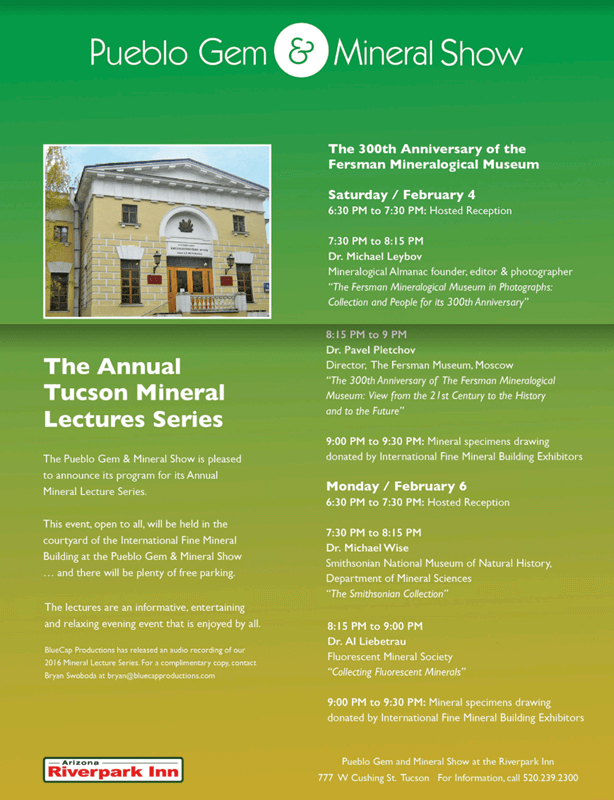 You are invited to attend the Mineral Lecture Series at the Pueblo Show which features Museum Curators and some of the top experts in the field. 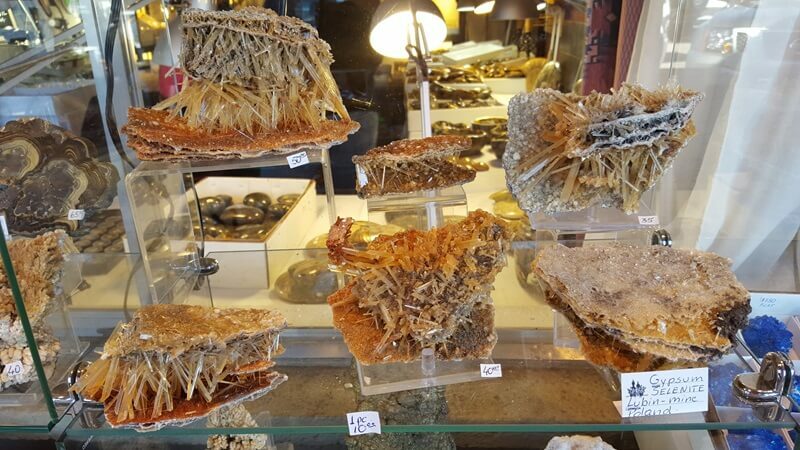 Each room boasts unusual specimens like this rough Gypsum/Selenite from the Lubin Mine in Poland. 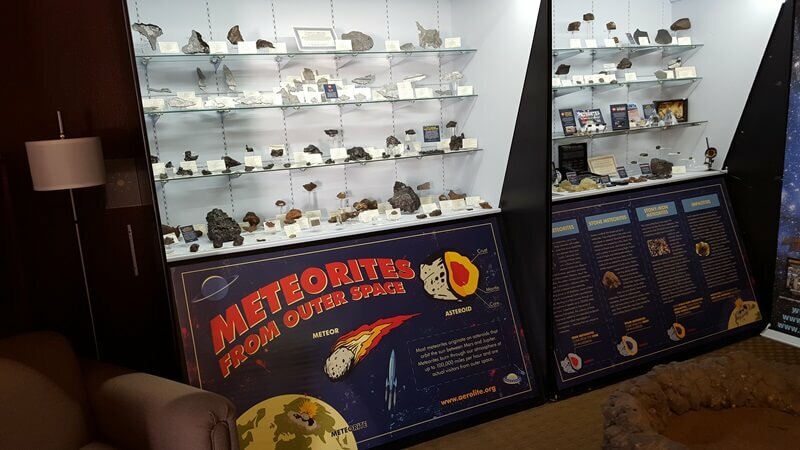 In the middle of the show tucked into an upstairs room is Aerolite Meteorites and one of TV's "Meteorite Men" Geoff Notkin. 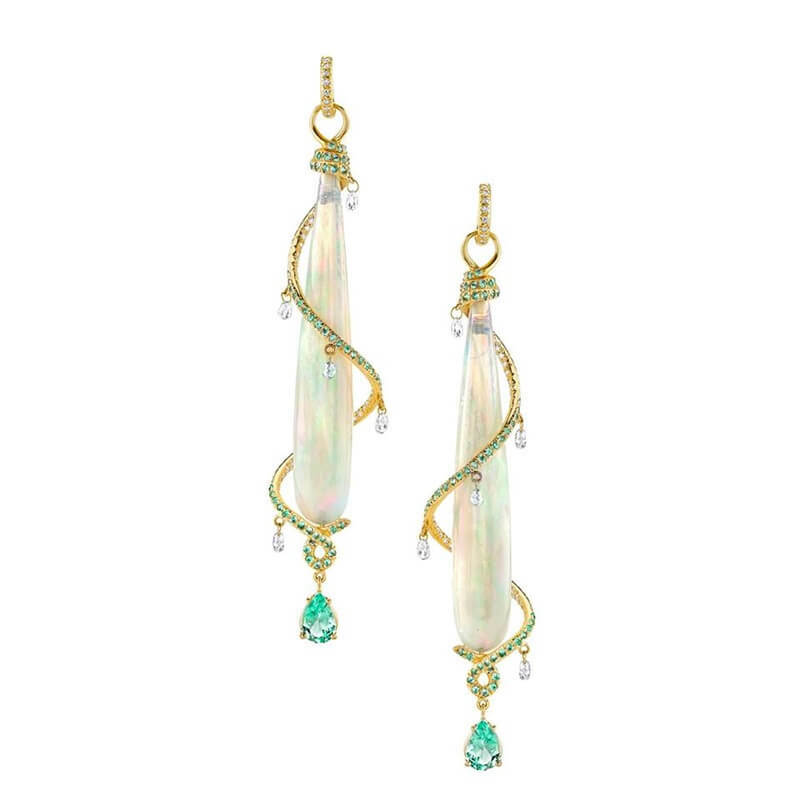 Award Winning Gem Cutter Darryl Alexander's latest experiments in Mabe Pearl and Opaque Gems. 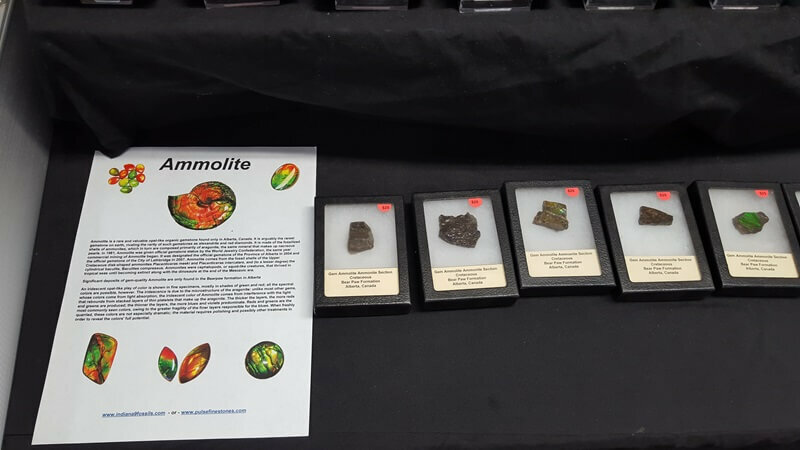 and there are Fossils in the AZ Mineral & Fossil Show at the HTCC - tiny Trilobites to giant fossil fish. 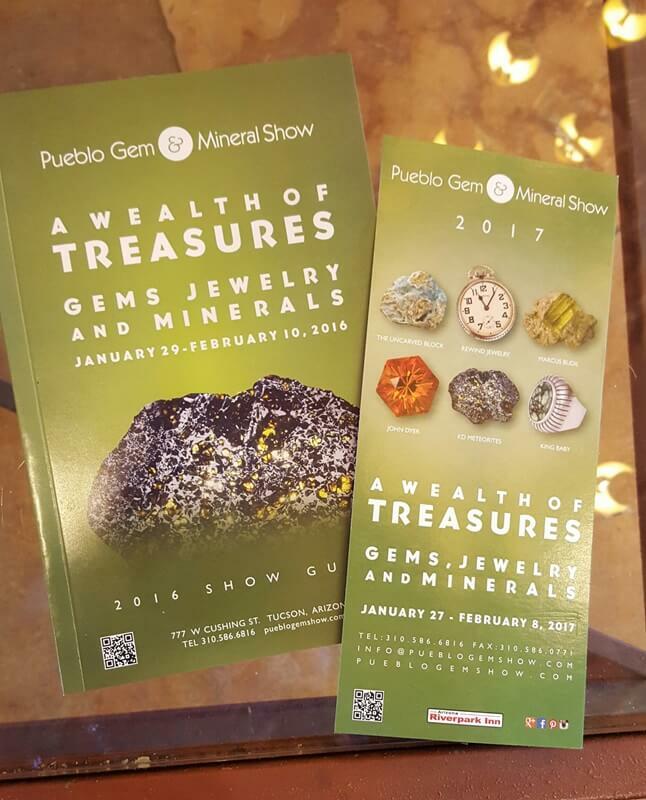 The Pueblo Show has almost everything you could want amazing minerals, faceted gems, jewelry, and gem rough! 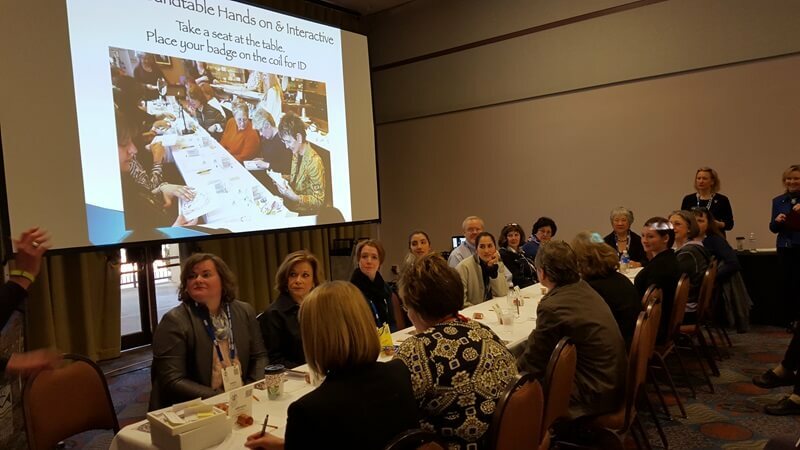 One of the coziest spots to catch a cup of coffee in the morning is the lobby at the Riverpark Inn with its warn fireplace. 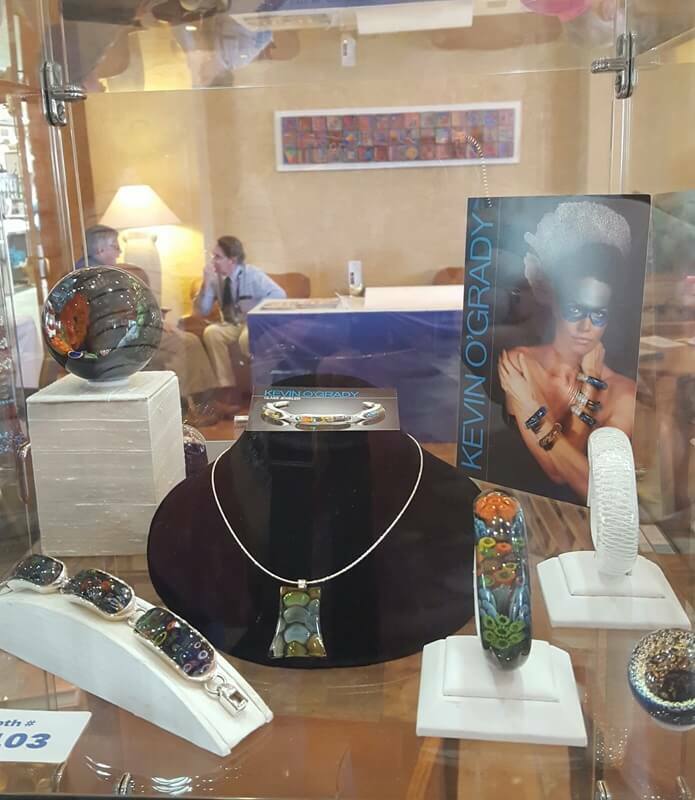 You can get a great overview of the show by perusing the display cases in the lobby - like this one from glass artist Kevin O'Grady. 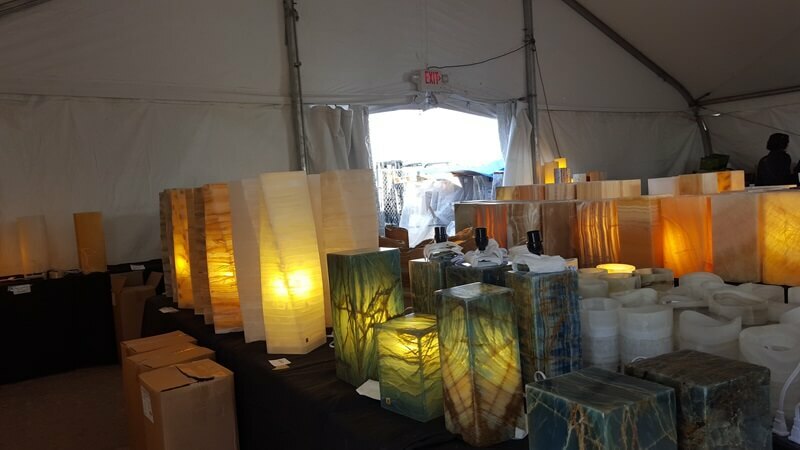 Booths are in hotel rooms at this show. 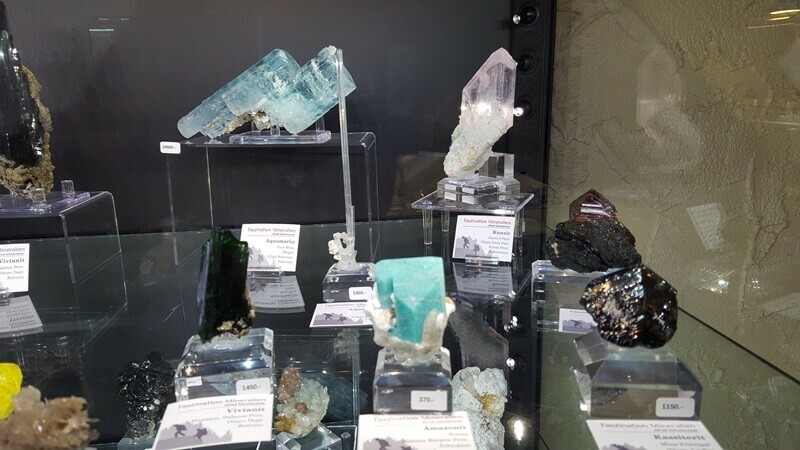 Aquamarine, Kunzite, Cassiterite and more in the Fazination Mineralien room. 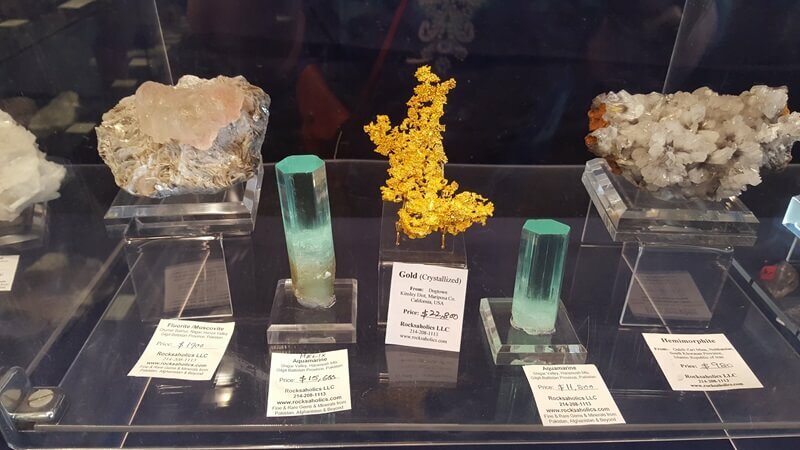 Stunning Minerals from Rockaholics - 2 of the cleanest Aquamarine flanking a stunning Gold Specimen. 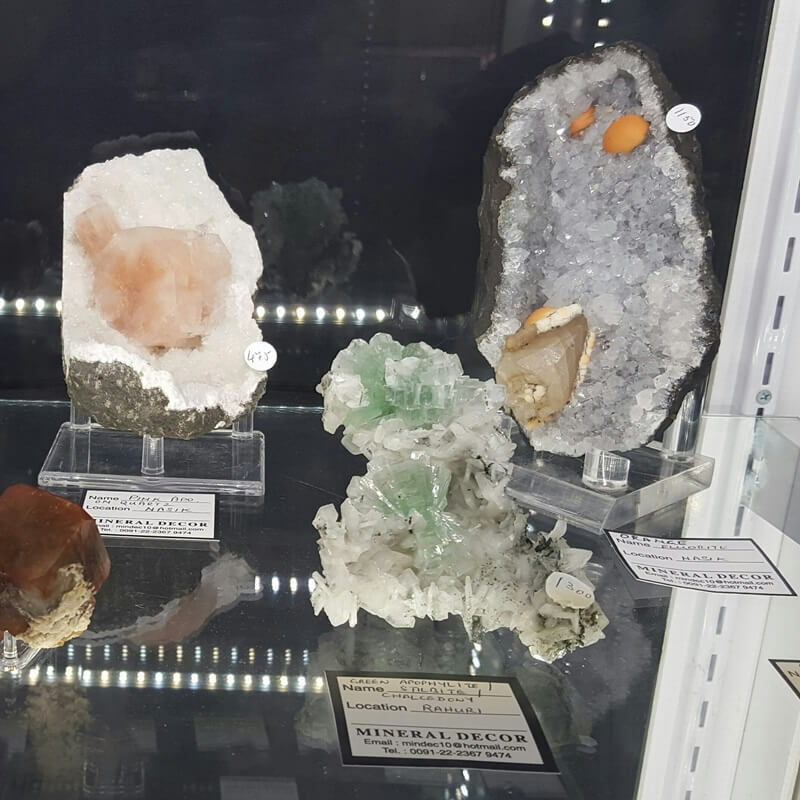 With roots in Pakistan and great connections in the Middle East the Rockaholics room always features some of the finest Tourmaline. 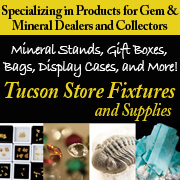 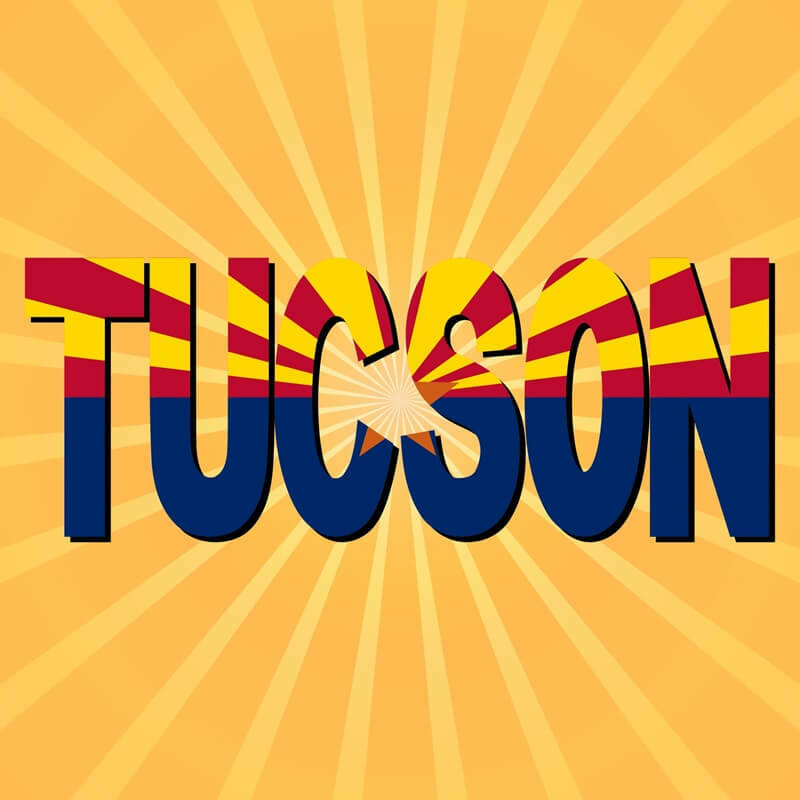 Known as the "Main Event", the Tucson Gem & Mineral Show is the show that started it all. 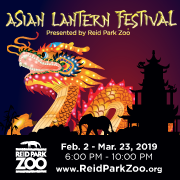 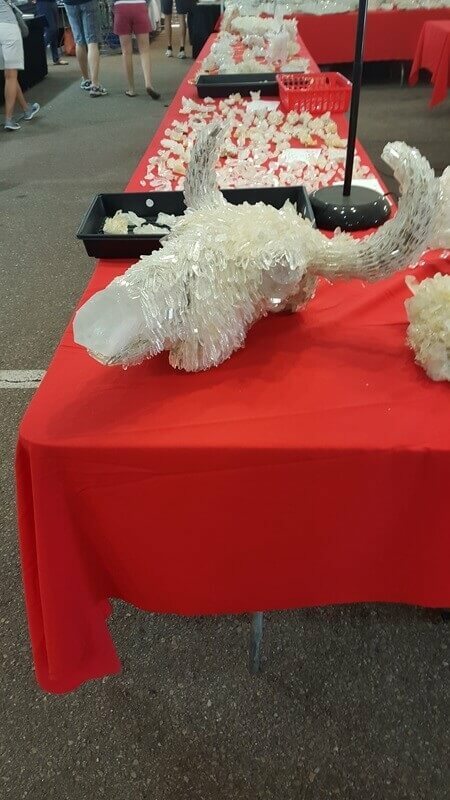 They set a theme annually. 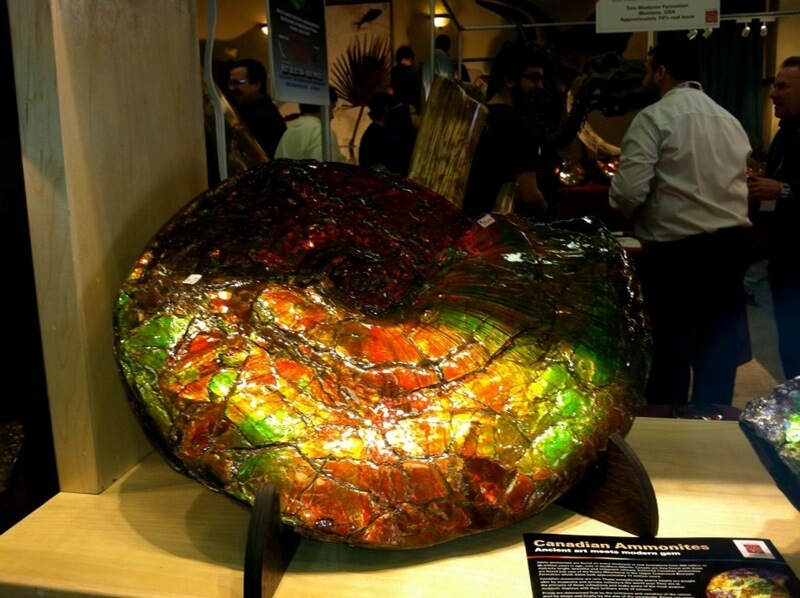 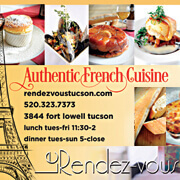 Now this is how you combine two interests - Mineral Wines - prize winning wines at the Tucson Gem & Mineral Show. 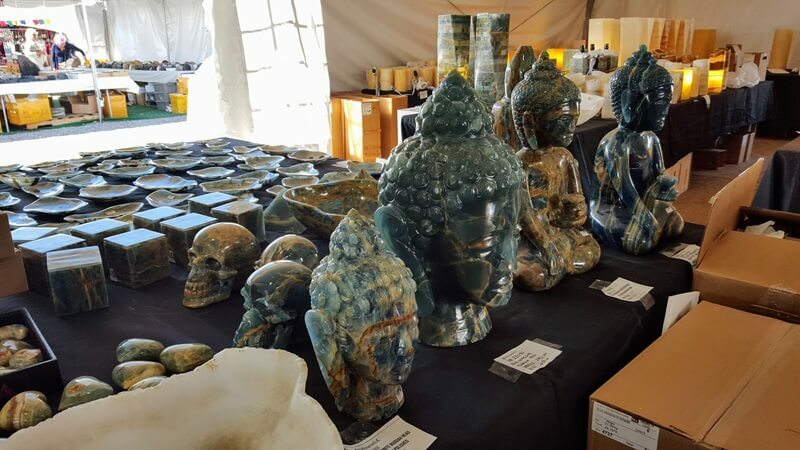 Carved Turquoise depicting the beginning of the move West in the US. 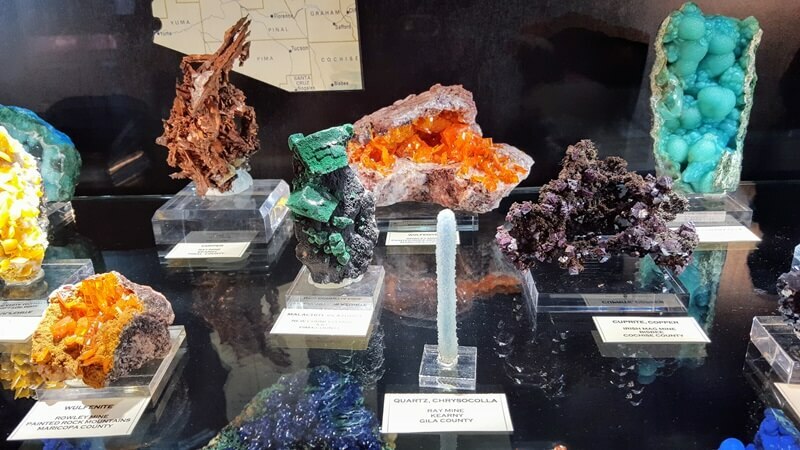 At the Arizona Mineral & Fossil Show at the Hotel Tucson City Center watch your step, you never know what could be lurking around the corner. 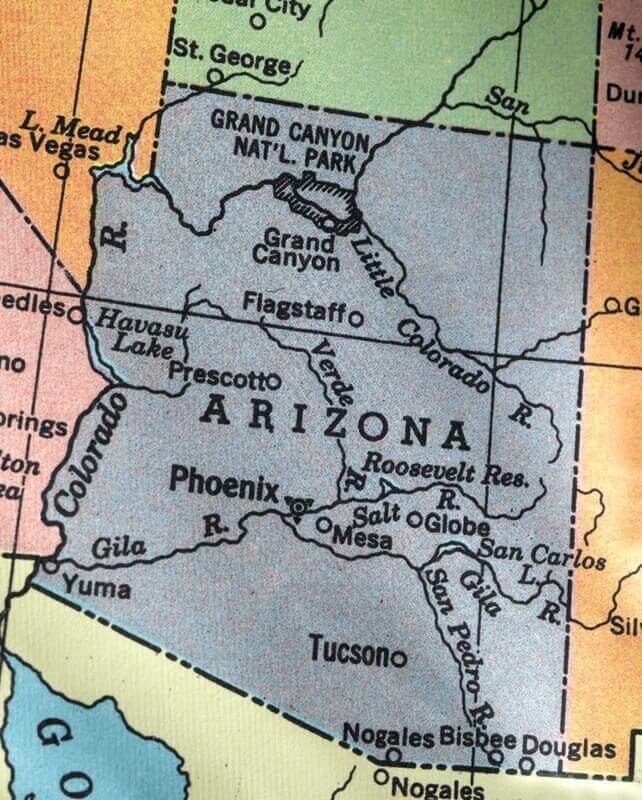 The Land That Time Forgot!!! 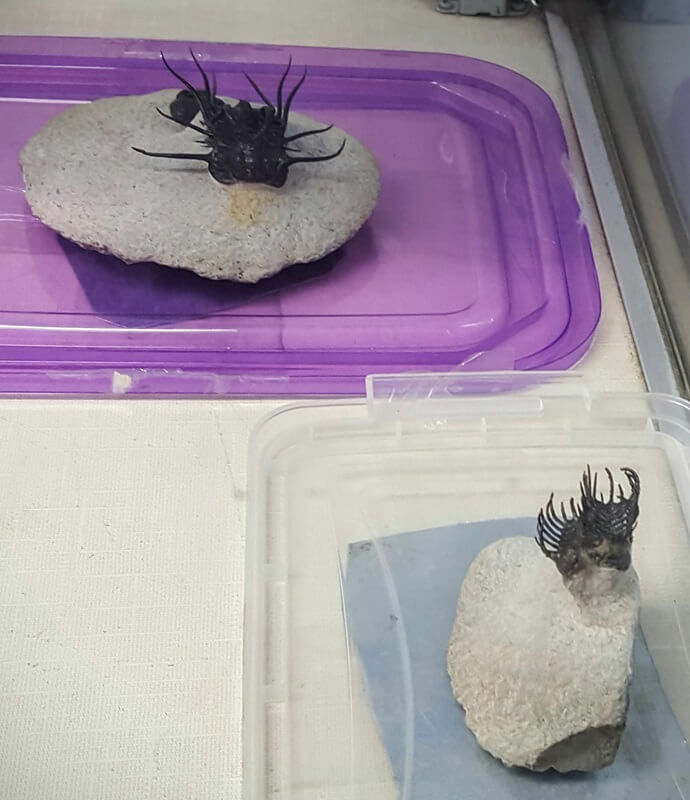 ....not! 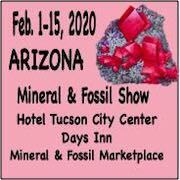 The Arizona Mineral & Fossil Show at the Hotel Tucson City Center has a huge array of goods from fine designer jewelry and gems in the Design Center above the Lobby to Gem sculptures and Dinosaurs around the pool. 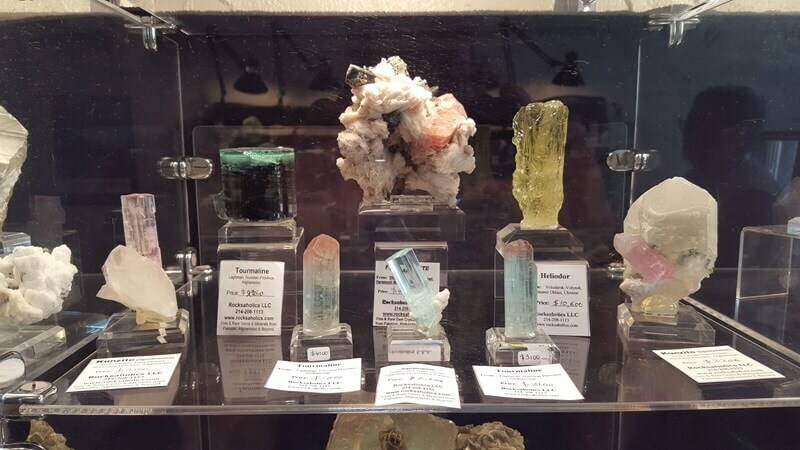 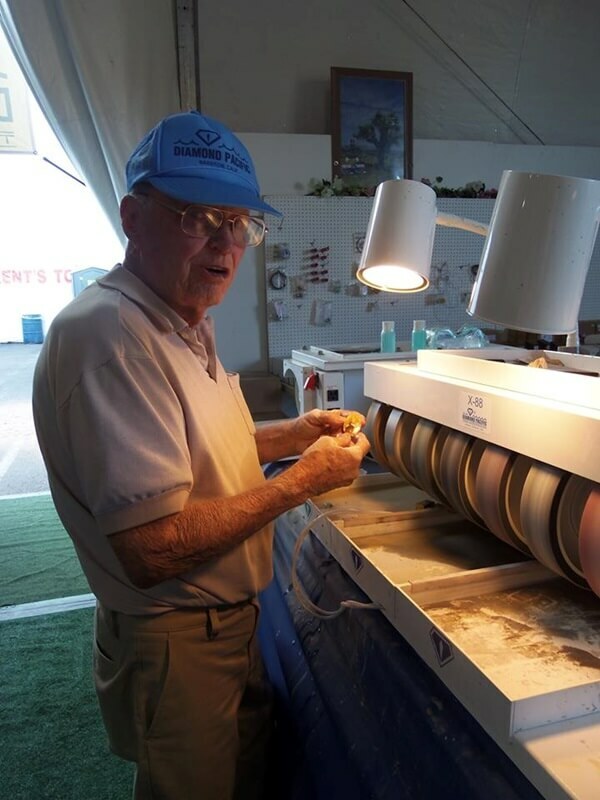 With over 300 vendors you will find a little bit of everything at the HTCC - but this is one of three locations for the Arizona Mineral & Fossil show - also in the Fossil Room, the amazing collection of Dino Poop (Coprolite) from Custom Paleo. 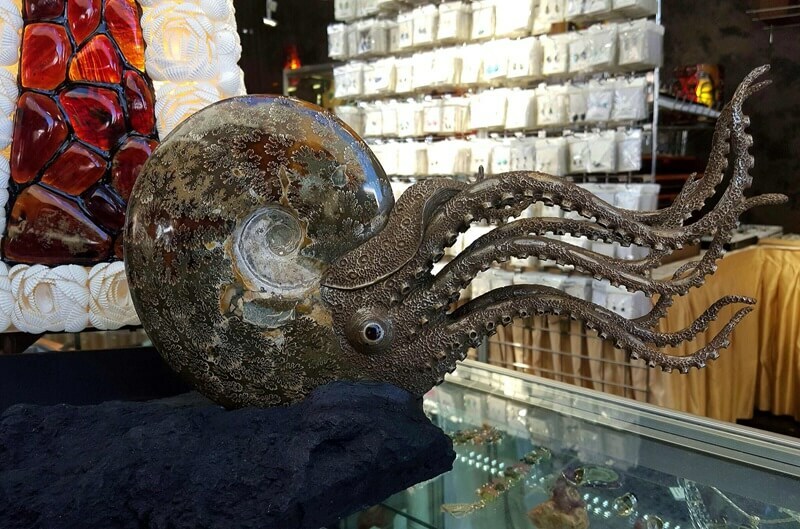 Canada Fossils brings the Ammonite in extra large sizes...check them out in the Fossil room. 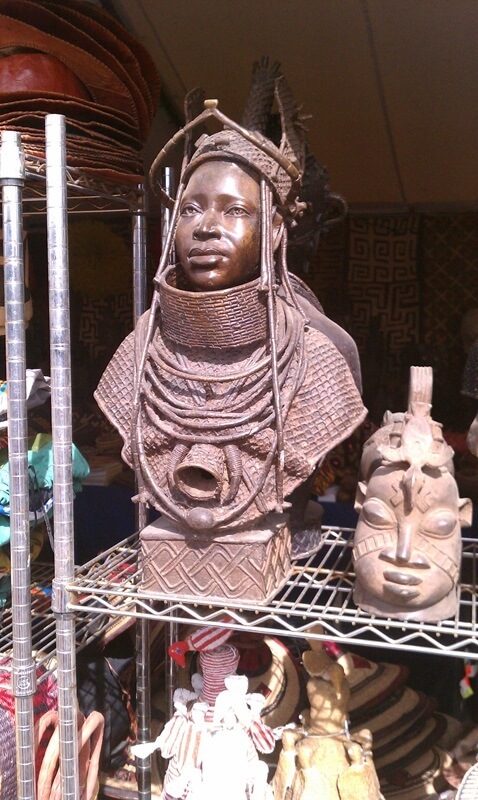 Don't miss the art and great foods at the African Village...its worth a trip for the Shea Butter. 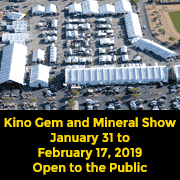 People ask how the "Club" show differs from the commercial shows around town...they provide booths with educational displays and the Tucson Gem & Mineral Show offers a "Kid's Morning" for local school children. 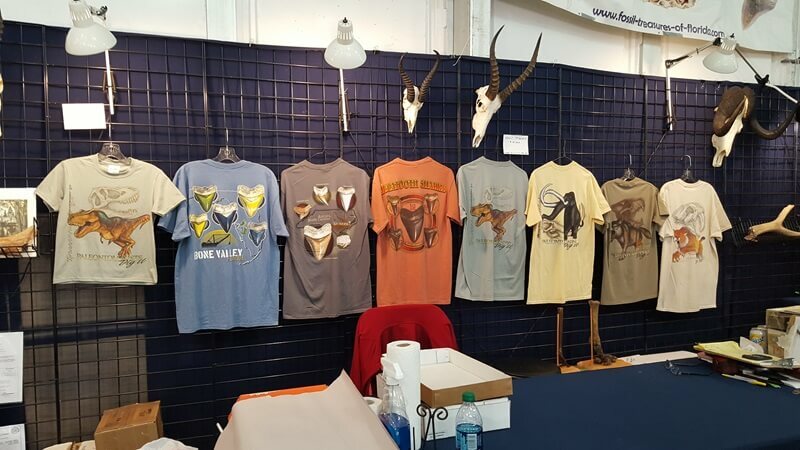 The Westward Look Mineral Show is at the beautiful Westward Look Resort - it is a bit of a drive, but worth every minute. 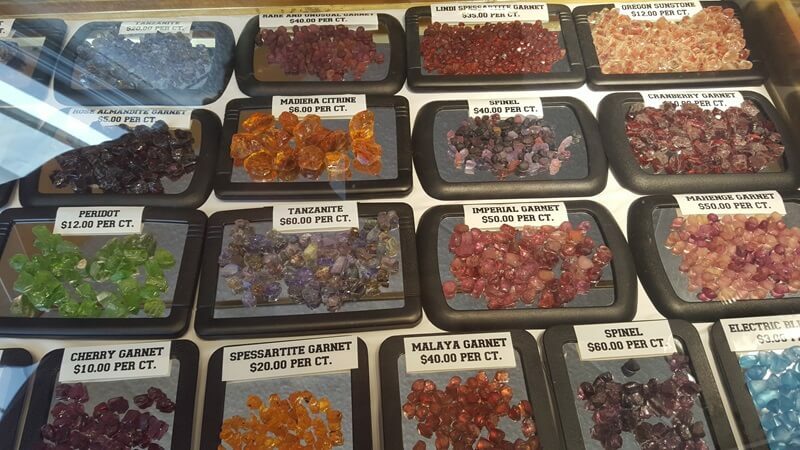 The AGTA Gemfair offers some of the finest FREE Seminars available - with topics to improve store sales to introducing colored gems to your inventory to trips into the most exclusive gem mining areas. 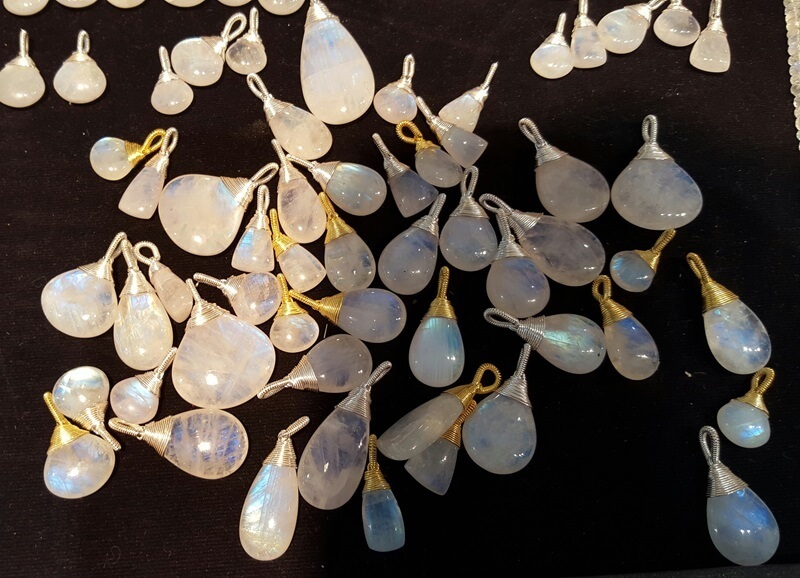 Beautifully hand wrapped Moonstone pendants will compliment any wire wrapped design...just one of the unique examples from this popular venue. 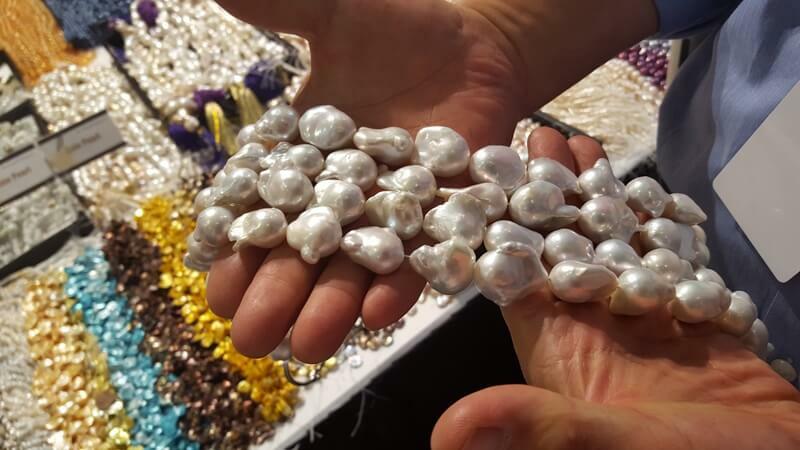 Mr. Wu's distinct line of pearls is truly unique, you will find examples that will be hard to duplicate anywhere else....and all at Wholesale prices. 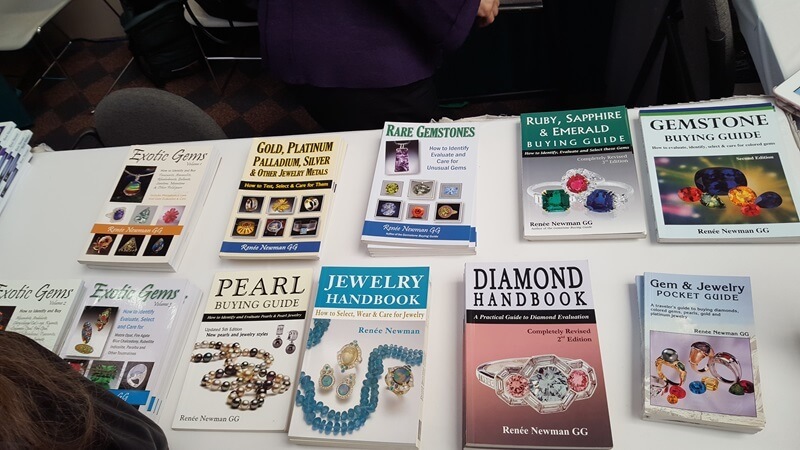 The 22nd Street Show leans toward products from the USA - and is the home of most of The Weather Channel's "Prospectors"
There are always opportunities to "Meet the Authors" at the AGTA show...keep an eye on the NEWS stories for this years listings. 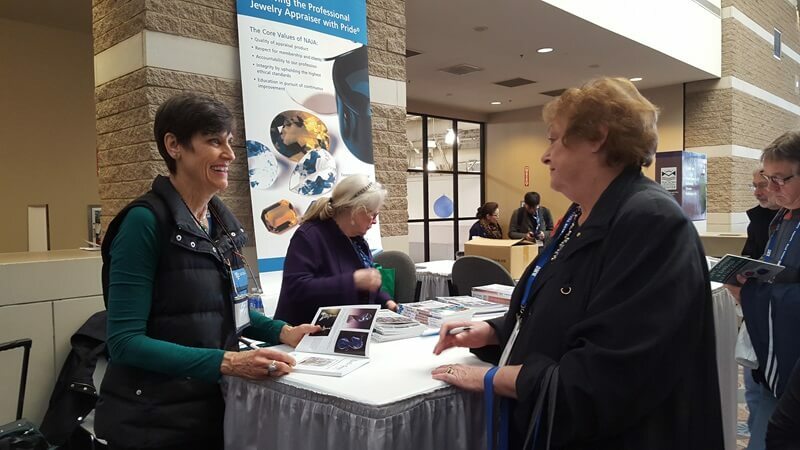 Renee Newman is a favorite in the NAJA (National Association of Appraisers) Booth. 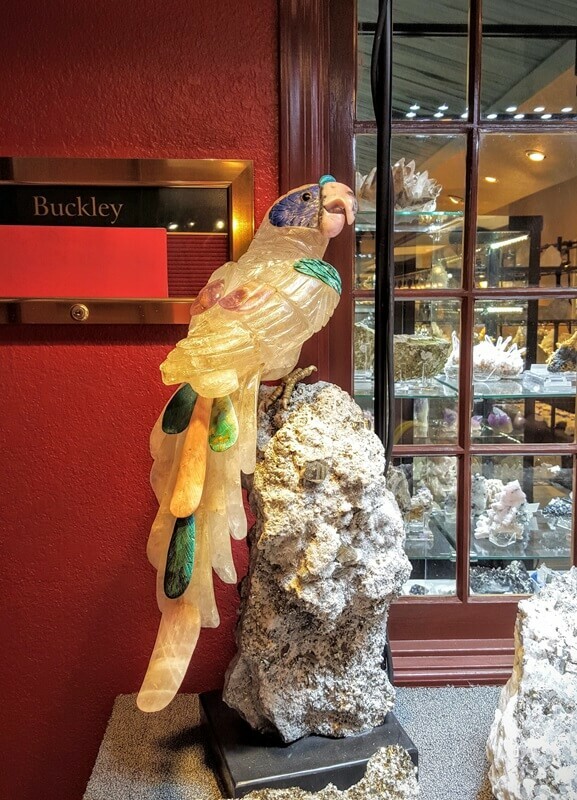 Be sure to check out the special exhibitor in the Lobby on "Collector's Day"
The Special Exhibits at the AGTA show are fabulous from The Cultured Pearl Associations IPDC Winners to GIA and the Somewhere In The Rainbow booth shown above. 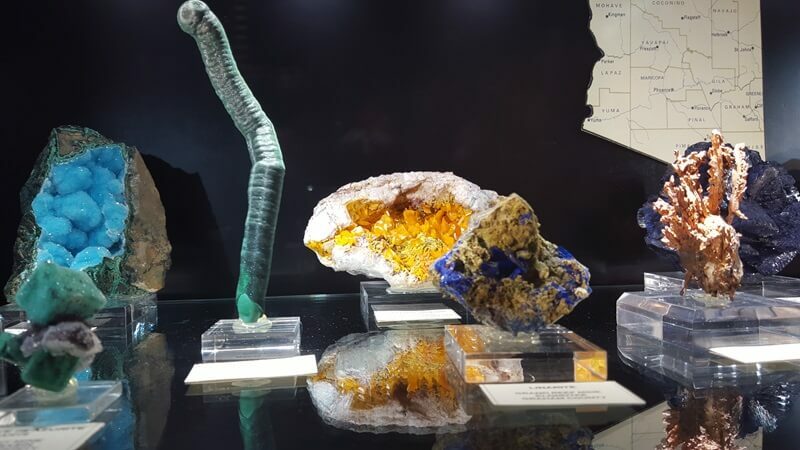 The Gem Photography of Michael Woodward is actually macro closeups of Agate, Opals and Ammonite. 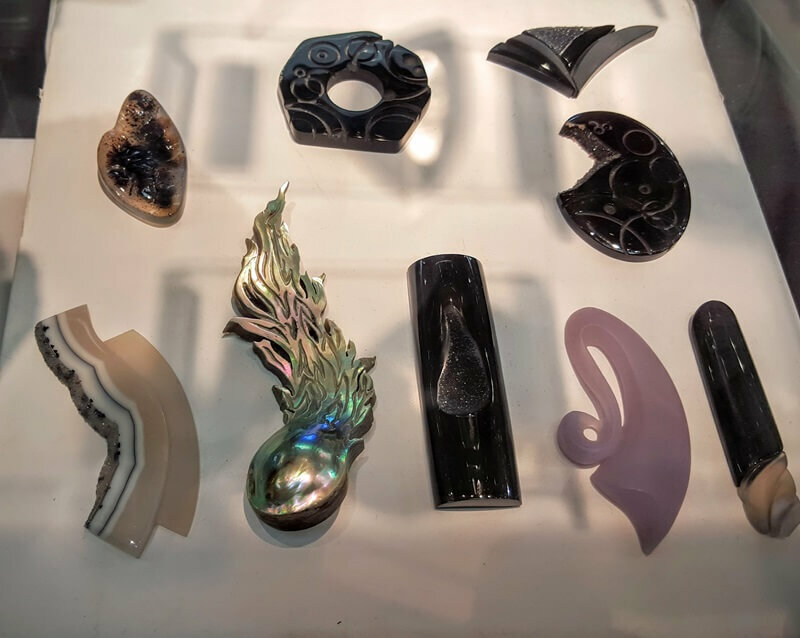 Each year the Design Pavilion features the Winners of the AGTA Spectrum and Cutting Edge Awards....above Erica Courtney Jewelry's "Milky Way" earrings won 2nd Place in Evening Wear during the 2015 Spectrum Awards. 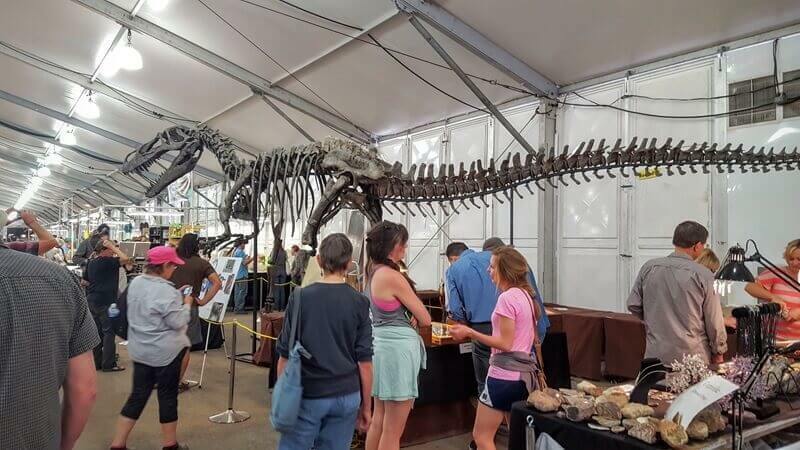 The Smithsonian booth is always impressive - check it out when you arrive and again before you leave....they accept donations throughout the show. 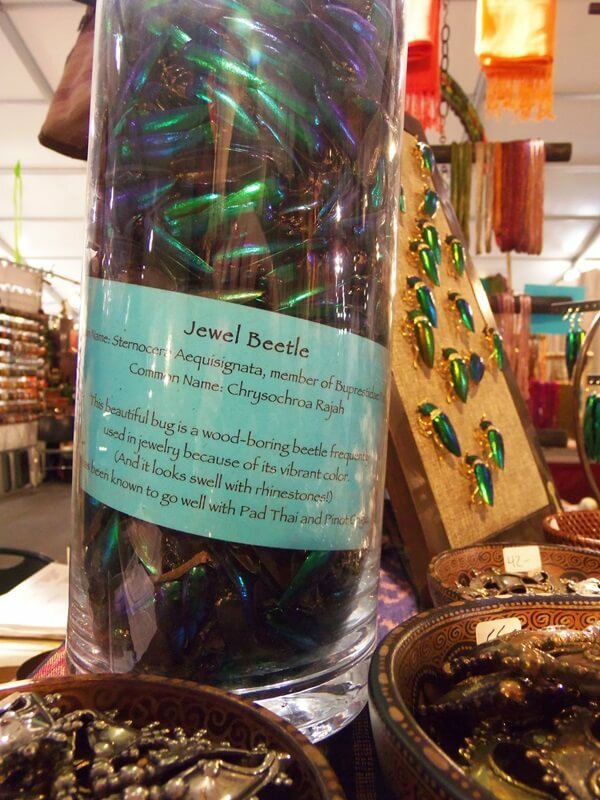 Here's an unusual offering....at the Bead Goes On booth you can purchase Beetle Wings, and all the parts you need to build your own Jeweled Beetle jewelry. 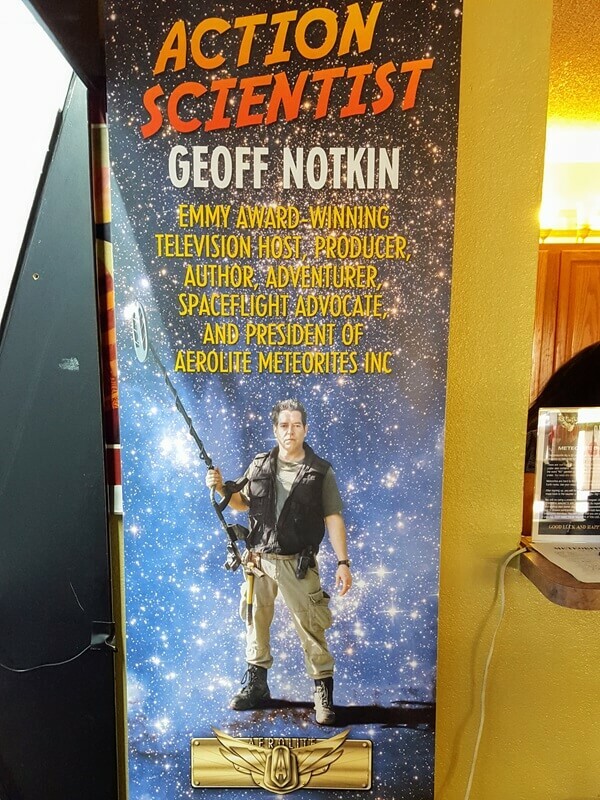 If you have ever wanted an autographed copy of one of Geoff's books, this is where you get it. 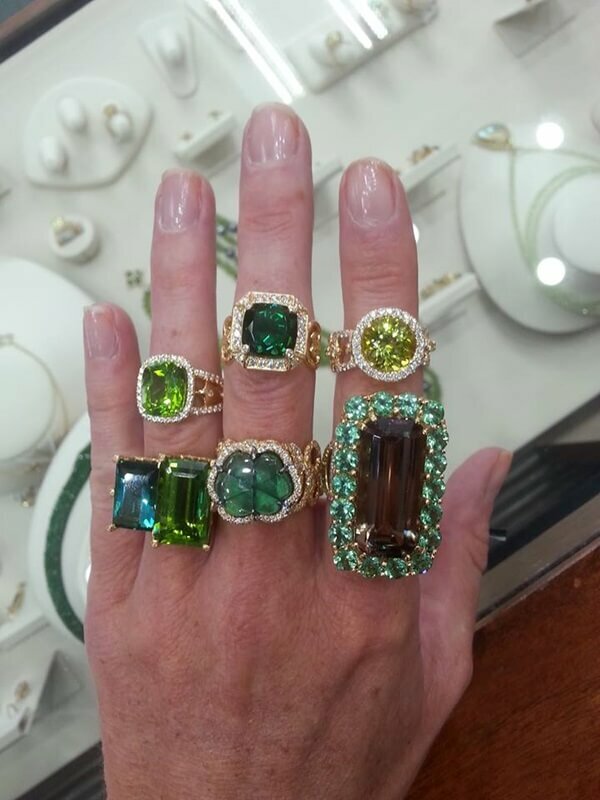 Iconic Cuts from Master Gem Cutter Darryl Alexander upstairs above the Lobby at the HTCC. 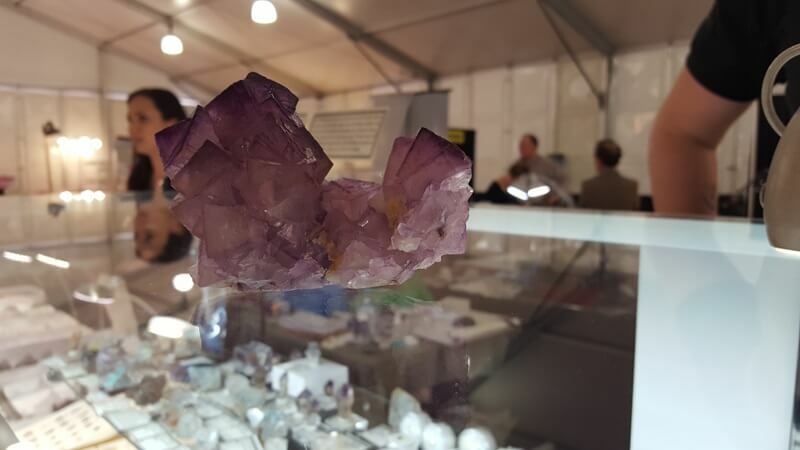 Oregon Sunstone from the Butte Mine in Darryl's trademark Plush Cut. 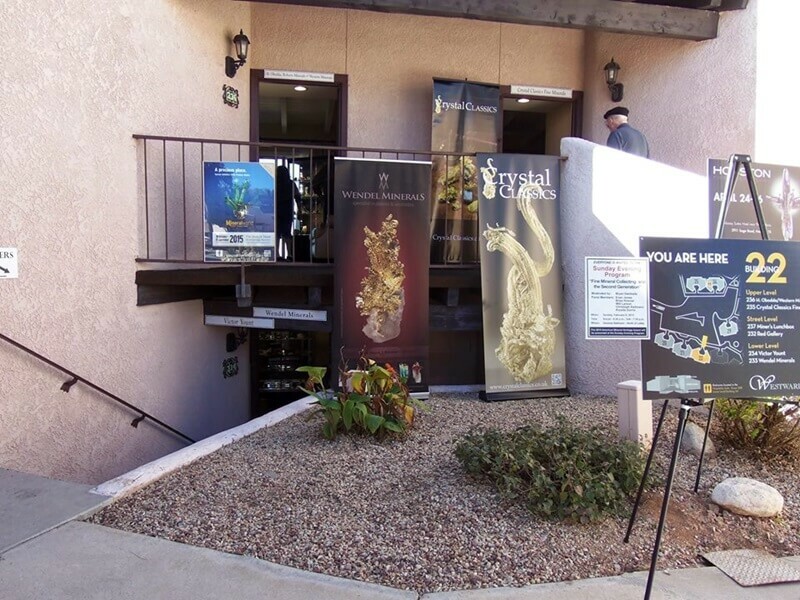 This is a hotel show on the grounds of the Westward Look Resort so the exhibits are set up in hotel rooms. 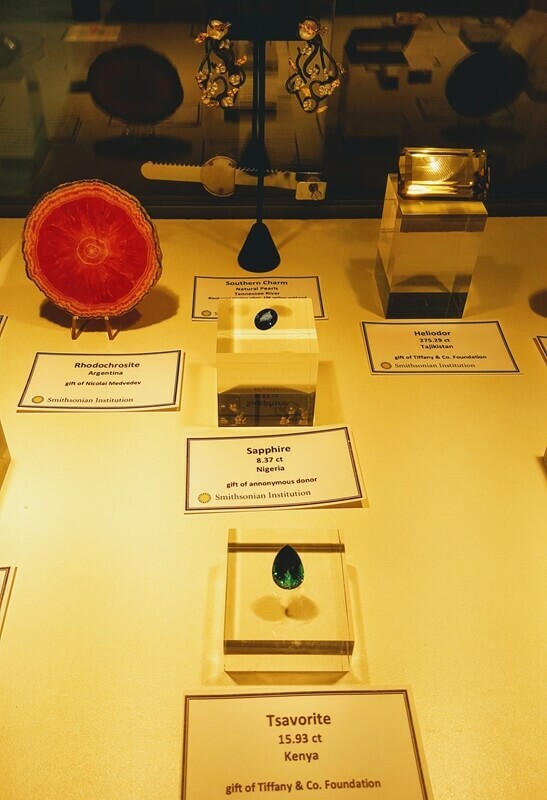 This show is a favorite among Museum Curators with high quality goods, very well displayed. 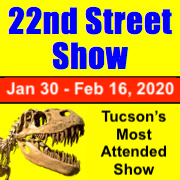 22nd Street Show has some very LARGE displays! 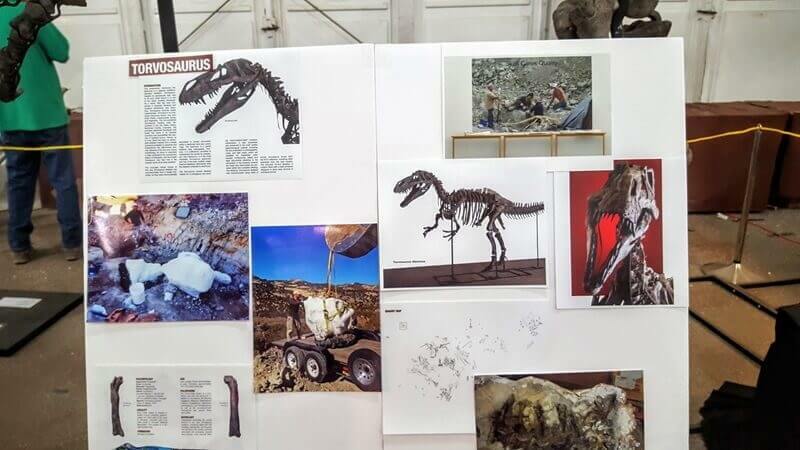 It was hard to get this entire life sized Torvosaurus in the frame! 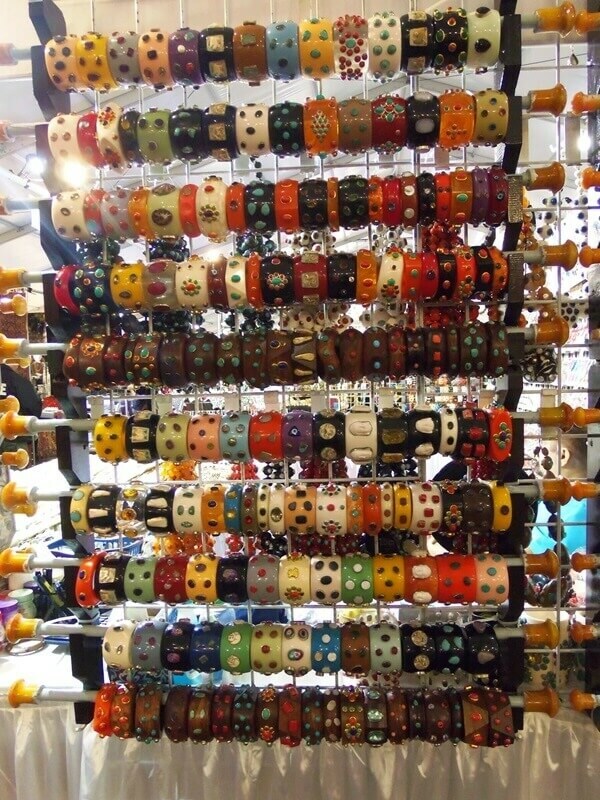 Don't you love this colorful display of Bakelite bangles vivid colors and hand crafts that include handbags and apparel.